A trained mechanical engineer (UNSW 1972), Robert Howard discovered fine woodworking as an amateur in the late 70s of last century, turned professional in the mid 80s, before celebrating the bi-centenary by becoming self-employed in mid 1988. He has offered private classes in fine cabinetmaking and woodcarving since the early 90s, and has written for the AWR since Issue 11. Robert is best known for his rocking chairs, and his hand carved wooden bowls. A: It was a three step process: I selected my parents with great care so as to get the necessary woodworker genes; this also ensured that I grew up on a farm, surrounded by tools, materials, and many woodworking opportunities; the final step waited until, at 29 years of age, I decided to learn to play the guitar and, being too poor to afford the type of guitar I needed to inspire me to play, I decided to make one. As it happened, I never did learn to play as I was completely overwhelmed by the joys of making. This was my first experience of ‘fine’ woodwork, and I fell madly in love with it. There was one final quirk of fate, however, for there was a downside to my choice of parents. I also inherited a gene for deafness, so I decided early on that my future as a luthier was likely to be limited, and this prompted me to move sideways into furniture making and woodcarving. I did not seriously begin my woodworking career until I was about 36 years old. A: My God was, as far as I know, not a woodworker, but his attitudes and values shape my way of woodworking. His name was Ned Ludd, and, in his honour, I like to think of myself as a Founding Member of the Society of Latter-Day Luddites. My Guru is also not a woodworker, but again is important for his influence on my aesthetics and my views on design. He is an architect, and his name is Christopher Alexander. If I was to give him a side-kick, I would nominate Robert Pirsig, a writer and another non-woodworker who has had an enormous influence on me. My woodworking heroes are numerous (and you will probably be able to see the connections between them, me, and my God and Gurus). I will mention here those wonderful Shakers of the past, as well as people such as Ernst Barlach, James Krenov, Ernst Gimson, and the Barnsleys. A: I make dining chairs, rocking chairs, jewellery cases and carved wooden bowls. And anything else that happens to take my fancy. My way of working is to make what I feel like making, when I feel like making it, and to worry about selling it afterwards. That is what I am psychologically comfortable with. A: What can I say? As a Latter-Day Luddite, I obviously lean to tradition. I fail to see why we must bow down to the new and different in lieu of the tried and the true. What is so terribly wrong with standing still? I do, however, love my Mac laptop and my Canon 10D, so sometimes progress has its rewards. In our field though, I loathe biscuits and dominos. They belong with MDF and kitchen cabinets. A: My pet hate is anything and everything cheap: cheap tools, cheap machines, cheap work. And sanding. I hate sanding. A: My desert island hand tool would be a Flexcut carver’s jack. My desert island machine would be my coffee machine. Or I might trade it for a good Wadkin PP tablesaw. For timber I don’t think I could go past a good lump of European lime, but I would settle for some nice Aussie cedar. My book would be Alexander’s four volume The Nature of Order. A: The best thing I have ever made is usually the latest thing I have made. Right now, that means the latest version of my rocking chair. I also have a soft spot for two of my bowls (pictured below). A: My excuse is that I’m not God so I’m not allowed to be perfect. A: Boy, there’s a bit of competition for this one! It’s a toss up between under-pricing my work leaving sanding scratches in the finish. A: My biggest disaster occurred late one night in the mad rush before an important exhibition, with every second counting, when I was gluing the top back rail on a rocking chair. There were six back splats, so 12 mortise and tenons, and a bridle joint at each end of the back rail to be glued. For ease of clean up I decided to go with PVA glue which, predictably, swelled each tenon, so the bloody thing locked tight half way on, and there was no way I could move it any further. So, in a mad panic, out came the lump hammer to disassemble it, which I was able to do, but not without the odd bit of collateral damage. A: I think wood should be instructed to be docile, well behaved, understanding, helpful and, of course, more plentiful. 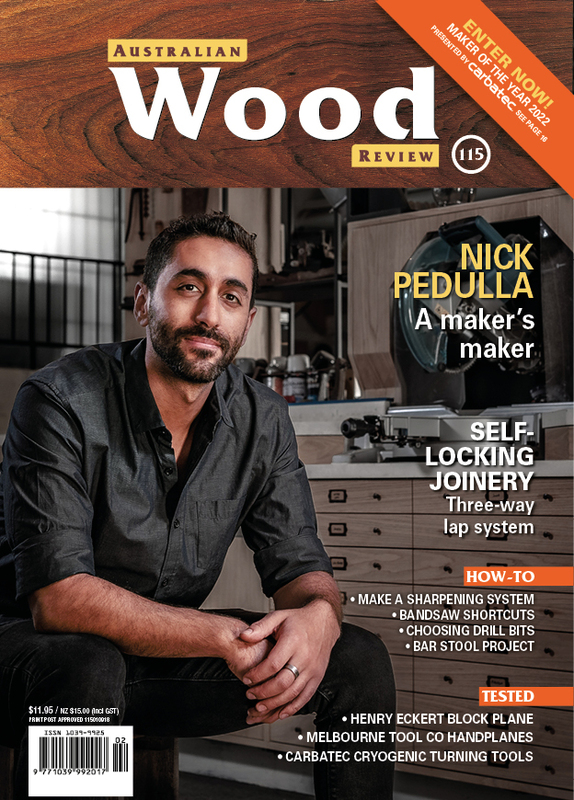 A: I would love to see more woodworkers indulge themselves by giving themselves the tools, machines and materials they need to really enjoy their woodworking. Happiness is the point of life, I think, so if you enjoy your woodworking you are blessed. Make the most of it. A: On a macro level I am never happy with what I have done. That is why I tend to make things, like my chairs, over and over again: I am chasing the perfect chair. I am as far away from it as ever, but I can’t let it go. On a micro level, without a doubt it is my impatience with finishing that I need to change the most. Especially with sanding! A: It is a fascinating, never ending challenge, intellectually, physically and psychologically. I love it.